Re-upholstery projects all pose a little challenge. From fabric selection of just the right material to the little details. 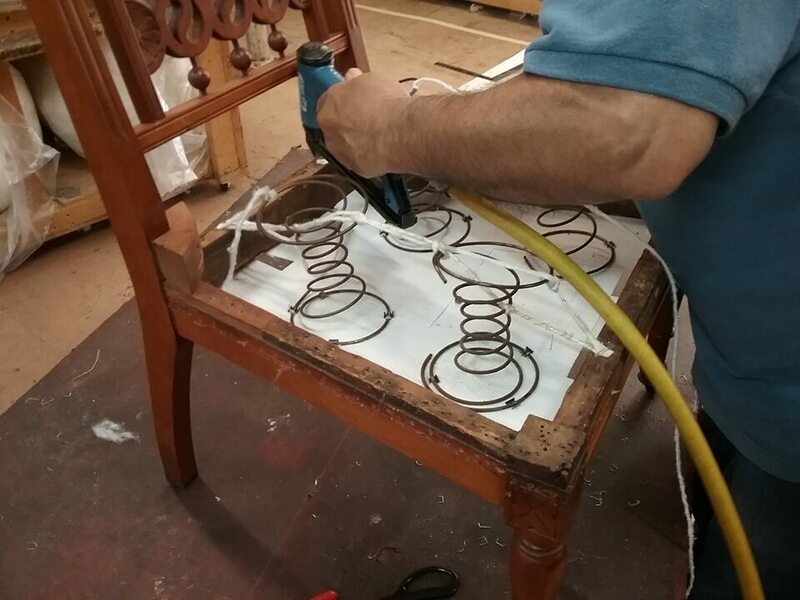 At MBU Interiors we take pride in paying attention to the little things that can make a big difference. In the re-upholstery of this chair, we have a large blue and white pattern to deal with. We took the time to review the pattern and determine the best position of the material. 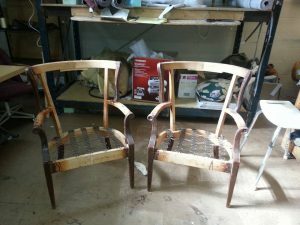 As you can see from the photos below, it came out beautifully. 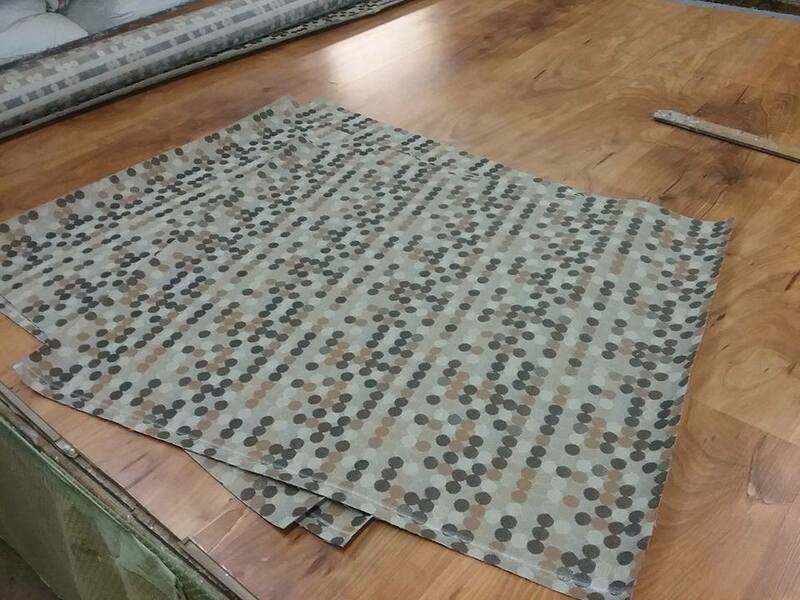 Also, in the production picture, you can see another part of an MBU project. 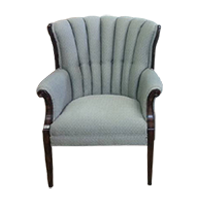 That is using the proper padding in the proper places to provide the most comfortable chairs and sofas possible. Chair in the process of being re-upholstered. 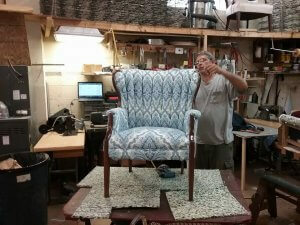 Wrapping up and inspecting the finished project. 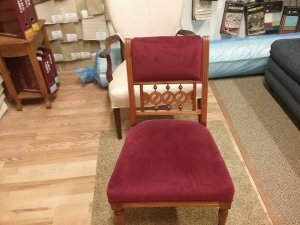 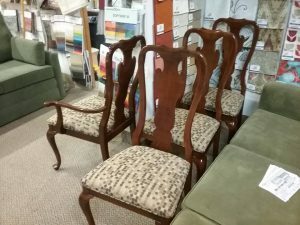 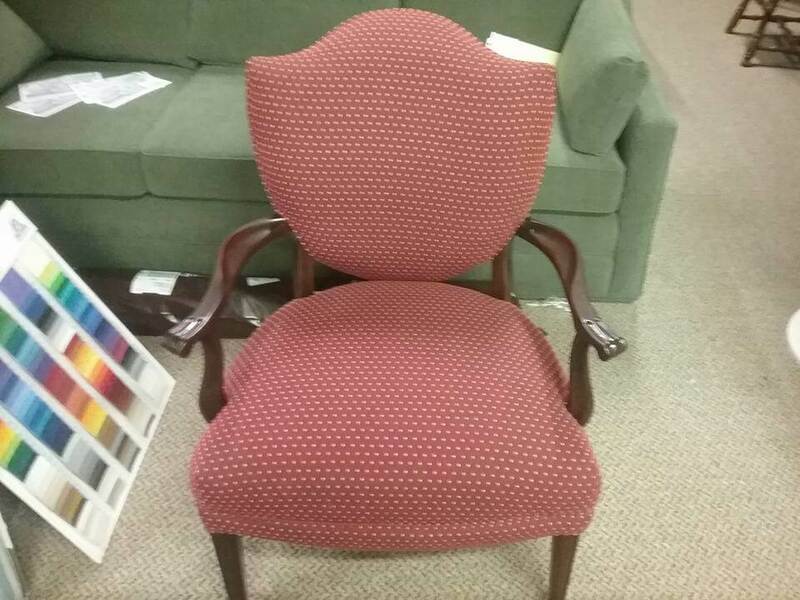 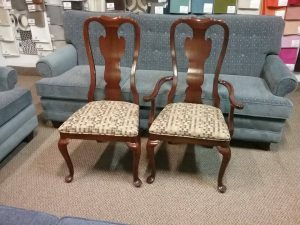 We were recently presented with two chairs to be re-upholstered at our Mentor Ohio shop. The chairs were worn and were a dated fabric pattern. 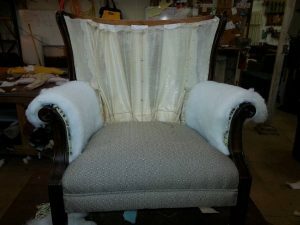 The customer chose a light grey fabric for the new look. 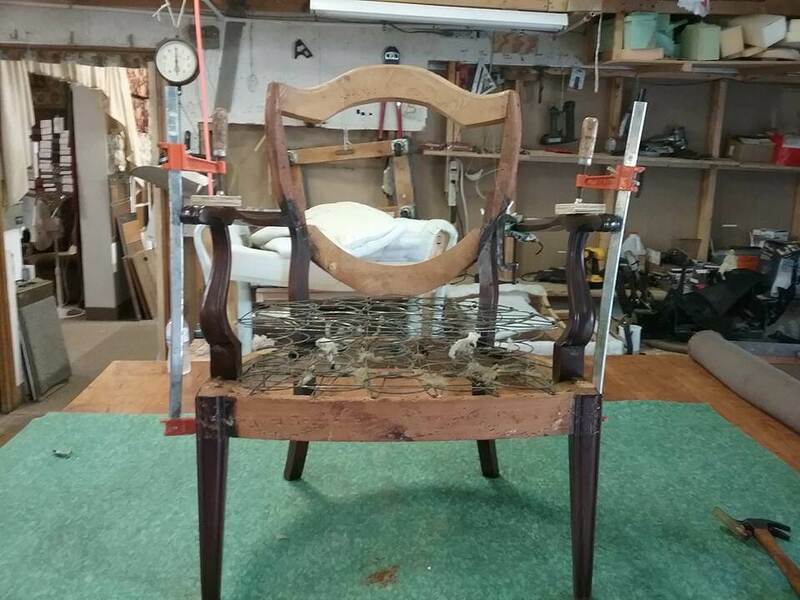 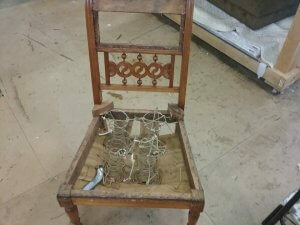 We started by removing all of the old material and padding, taking it down to the bare wood chair frame and springs. 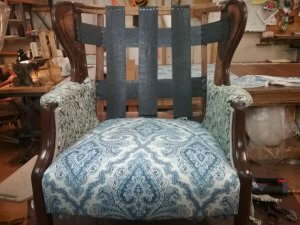 We then added padding to the chair base and and finished the seat. 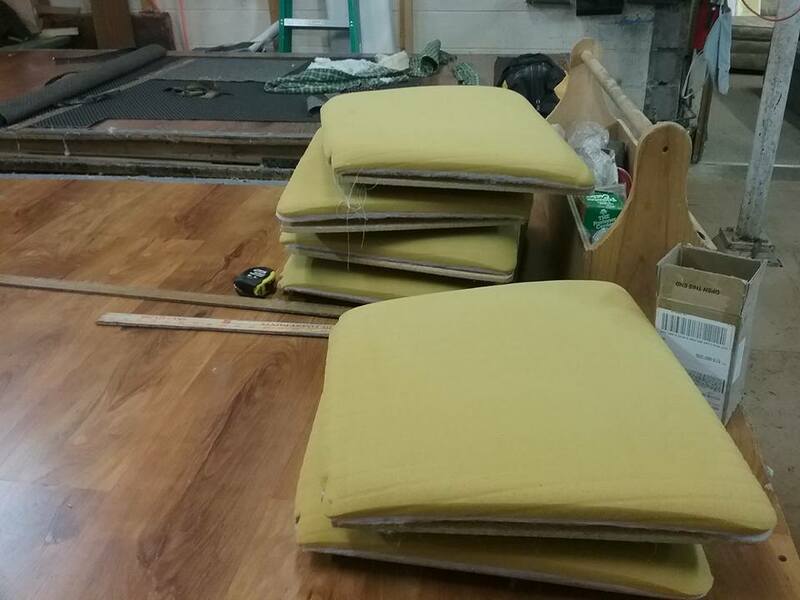 From there, we added the backing, new padding wrapped around the arms of the chairs and finished up by adding the back chairs back rest padding and the finished upholstery for the back and arms. 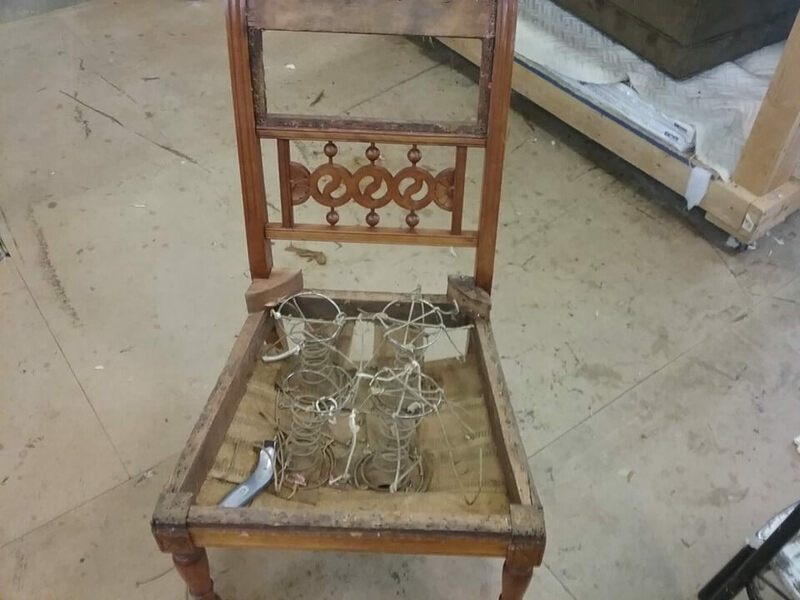 If you have a chair that you love the structure and possibly sentimental value, why not give it an updated look, making it fit into your current decor and turning it into a beautiful, usable piece of furniture once again. 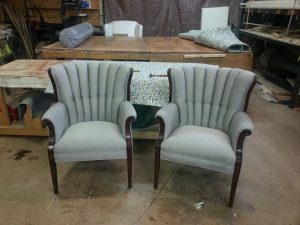 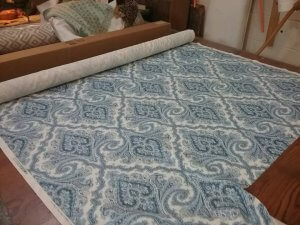 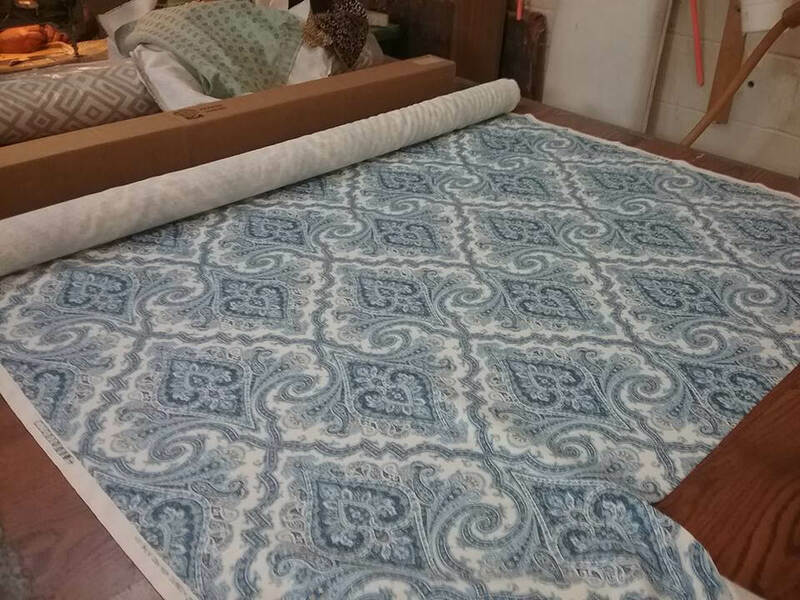 Give us a call today to see how we can help you pick the best fabrics and bring that old piece of furniture back to life. 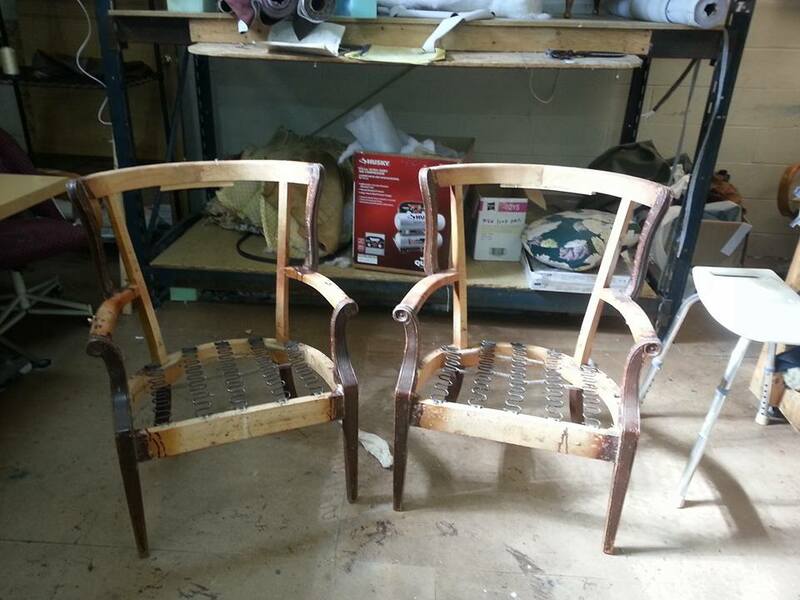 MBU Interiors was asked to update two very different looking chairs. 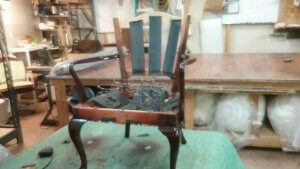 The first was a bent wood arm chair with a beautiful dark wood finish. 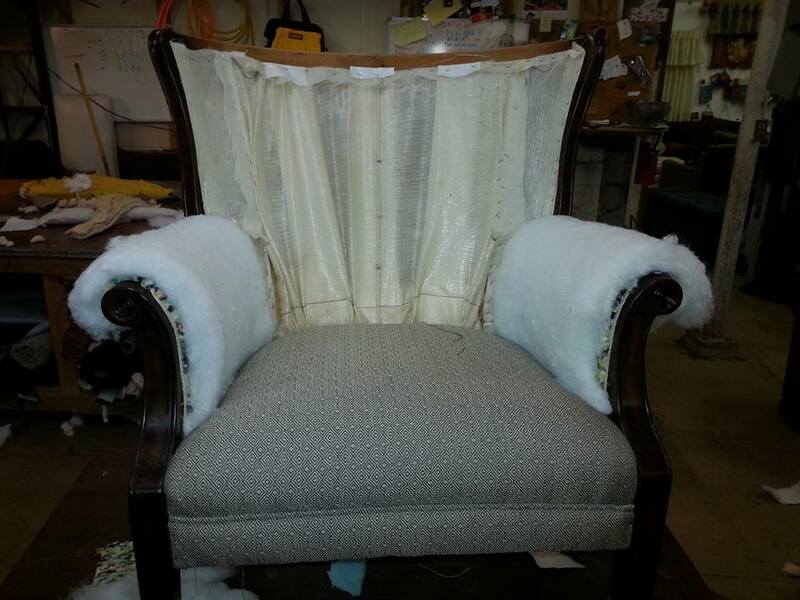 We fashioned a new back panel and installed a new seat cushion in a light green material. Bentwood framed chair being prepped for reupholstery. 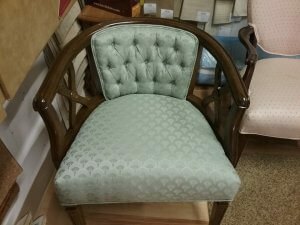 Bentwood framed chair after reupholstery. 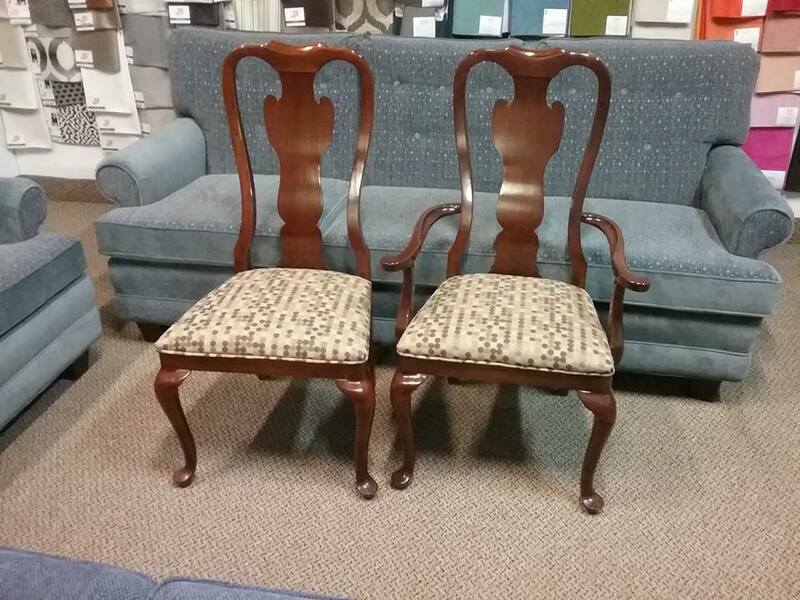 The second chair is a more traditional but equally beautiful straight back chair with an interesting detail in the back frame. 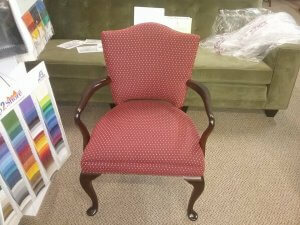 For this chair we also created a new back panel and installed new springs, padding and material. 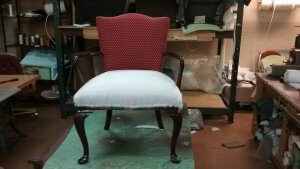 Reupholstery finished on a straight back chair. 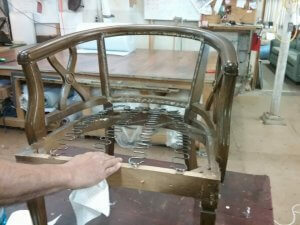 Straight back chair during reupholstery. 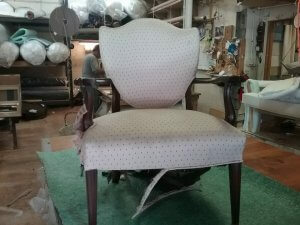 Straight back chair before reupholstery.